It’s Time – Schedule Your Colorado Gives Day Donations! Q. Would you say you’re more of a planner or a procrastinator? You're going to be thrilled. Do we ever have the tool for you! Starting today, November 1, you can schedule all of your Colorado GivesDay donations. These donations will process on Colorado Gives Day, December 6, and still qualify for the giving day perks like the $1 Million Incentive Fund. You're in good company. As a fellow procrastinator, ColoradoGives has just the tool to help us kick the habit. Starting today, November 1, we can schedule our Colorado Gives Day donations to make sure we don’t miss our chance to support nonprofits working to make our communities better. Scheduled donations will process on Colorado Gives Day, December 6, and will receive a boost from the $1 Million Incentive Fund. Go to ColoradoGives.org. Search for nonprofits or fundraising pages. Press the orange “Donate” button on the search result listing. Add your donation amount and press the “CO Gives Day” button to schedule it to process on December 6, 2016. Want to donate to more than one organization? 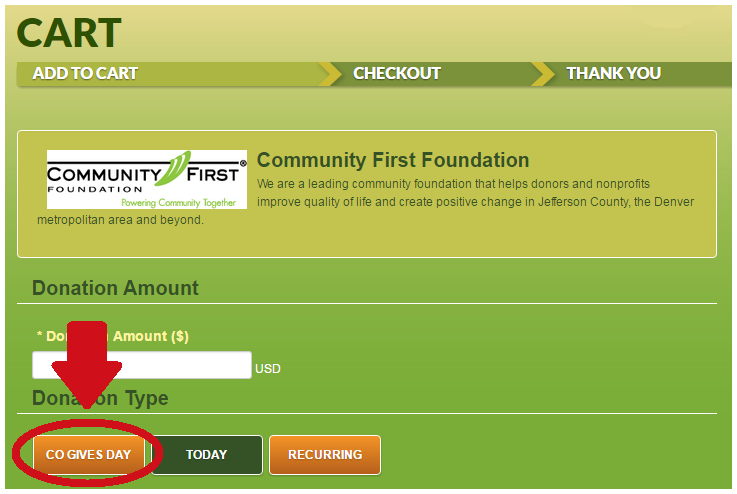 Click on the “add more nonprofits to cart” button on the next page and keep going! Please note, if you want to add nonprofits to your cart over the course of several hours or days and checkout at a later time, you can save the items in your cart by logging into or creating a donor account. Once all your scheduled donations are in your cart, finish checking out by clicking the “Checkout” button, logging into or creating a donor account, entering your payment information, and then pressing submit. Be sure to click the "CO Gives Day" button to schedule a donation for December 6, 2016, and take advantage of the $1 Million Incentive Fund. Please note you will receive an acknowledgement email indicating you have scheduled a donation. On Colorado Gives Day, you will receive a second email that confirms your donations have been processed. A copy of this email will also be stored on your donor account and can be accessed at any time. Donations are tax-deductible as allowed by law.